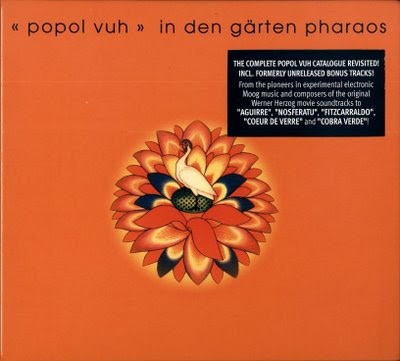 Few German groups were as inventive as Florian Frieke's musical vehicle Popol Vuh, named after the holy book of the North American Maya Indians. Fricke was born on 23 February 1944 in Lindau. During the sixties he studied grand piano and composition at the Freiburg university. After this, he worked sporadically as a music and film reviewer, and befriended someone who was to be a huge influence on his musical career: Eberhard Schoener, then the leader of the Munich Kammeroper. Schoener taught Fricke about the potential of a moog synthesizer. In the Spring of 1969 Fricke formed the first Popol Vuh crew of the initiative of Liberty records. The record label wanted Fricke to make an experimental moog synthesizer album. It seemed likely that Liberty planned to cash in on something like the Walter Carlos-album Switched On Bach, which had recently been a surprising commercial success for CBS. The resulting album Affenstunde (1970) was really something totally different from this! A mystical journey through spooky tonal landscapes of gargling moogs and ethnic percussion. This music attracted attention in the growing underground rock scene, and Popol Vuh recorded the five subsequent albums for Pilz/Kosmische Musik. In Den Garten Pharaohs (1972) was the follow-up, a development on their first album with the same musical ingredients. To create a more meditative effect Frieke also played organ and electric piano. The album contained just two extended tracks: "In Den Garten Pharaohs" and "Vuh". In 1972 Fricke also experienced a religious revival. When he converted to both Christianity and Hindu, he discounted electronics for a more acoustic style and re-organised Popol Vuh totally. This team made Hosianna Mantra (1973), an album with titles like "Kyrie", "Segnung" and "Andacht" The angelic soprano voice of Yun matched the aesthetic and meditative music. The only similarity with the two previous albums was the slight ethnic touch. This album was the point of departure for Fricke's further career. One of the most significant decisions in that career was when he participated on Conny Veit's second Gila album and as a consequence met Daniel Fichelscher, previously the drummer in Amon Duul II. Fricke and Fichelscher became the nucleus of Popol Vuh for future albums. The first of these, Seligpeisung (1973) improved the meditative style of the previous album. Fricke decided to sing the lyrics from Song of Solomon himself, adding an amateurish touch to the music (like Incredible String Band when their girl-friends were involved). It benefited from Fichelscher's twin instrumental talents - both as a guitarist and percussionist. Eliscu, Veit and Wiese also contributed to this album, recorded by Dierks in Stommeln and Baumburg. Aguirre (1975) featured some of the music from Werner Herzog's film of the same name. Herzog and Fricke were long term friends from Fricke's days as a film reviewer. This was a strange release, as it compiled recent alternative studio takes with the original music for the film. The long piece "Vergegenwaertigung" was a solo Fricke electronic number, a throw-back to the first two Popol Vuh albums, probably recorded in late 1972. Also "Aguirre I" was recorded before Fricke discarded the moogs and mellotrons. This was a majestic and floating large scale track. "Morgengruss II", "Agnus Dei" and the guitar part of "Aguirre II" were probably recorded in May 1974 at the sessions for the forthcoming album Einsjager Und Siebenjager and were fine examples of Fichelscher's brilliant guitar work. The album was originally only released in France and Italy. To add even more to the confusion, the German re-release on Pop-Import 1982 had three later Popol Vuh tracks, "Wo Bist Du, Der Du Uberwunden Hast" and "Auf Dem Weg" from Die Nacht Der Seele: Tantric Songs (1979) and "Die Umkehr" from Bruder Des Schattens - Sohne Des Lichts (1978), replacing "Vergegen-waertigung". This is not mentioned on the cover nor the label. Either it was a mistake or an illegal replacement due to the loss of master tapes. Einsjager Und Siebenjager (1975) was recorded by Fricke, Fichelscher and Yun in Bavaria in May 1974. By this time Fichelscher also had begun to compose music. On this occasion, some of Popol Vuh's best music ever was recorded. A typical track of this period had a drum (Fichelscher had a particular passion for the use of cymbals) and piano backing with two guitar overdubs playing the melody lines and Djong Yun's magnificent voice added on the top. "King Minos", "Morgengruss" and "Wurfenspiel" were good examples, "Gutes Land" was a re-titled version of "Agnus Dei", already recorded twice on the two previous albums. Tile title track was a major work of 19 minutes, a recital of different musical themes. All lyrics were adapted from the Song of Salomon. Das Hohelied Salomos (1975) included more of such adaptations. The music was as beautiful as before, now with added help from Al Gromer (sitar) and Shana Kumar (tablas). Al Gromer also contributed to the next five Popol Vuh albums. Letzte Tage, Letzte Nachte (1976) was arguably their most pompous and grandiose album. The music was much more powerful and energetic than usual. Fichelscher's guitars built walk of sound backed by massive cymbals and drumming. Fricke's piano almost drowned in this Amon Duul-like inferno of sound. Popol Vuh have been true pioneers of meditative music and "world music", guided by the unique musical vision of Florian Fricke. Every album is excellent in its own right, but for beginners I will particularly recommend Einsjager Und Siebenjager and Das Hohelied Salomos.